Iowa Gov. Terry Branstad and Lt. Gov. Kim Reynolds announced that they will travel to Cedar Rapids today for the dedication of a “Buddy Bench” at Arthur Elementary, 2630 B Ave. NE, and make an announcement regarding the administration’s efforts to end bullying in Iowa’s schools. Former Arthur Elementary student Isaac Taylor wrote the governor’s office in June about his Buddy Bench project, which grew out of his desire to stop bullying at school. Isaac, who is now in middle school, has been working to raise money with the goal of installing Buddy Benches on at least 17 additional school playgrounds in the Cedar Rapids area to foster friendship. Six benches have been purchased so far. The Buddy Bench idea, Isaac said, originated with a student in Pennsylvania. The governor and lt. governor will join Arthur’s faculty, staff and students when Isaac cuts the Buddy Bench ribbon on the Arthur Elementary playground. At the conclusion of the Buddy Bench dedication, Branstad and Reynolds will make an announcement regarding their anti-bullying efforts. 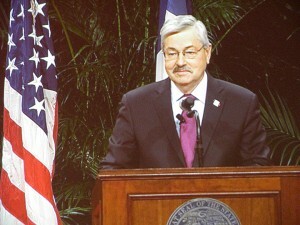 For three years, Governor Branstad, First Lady Chris Branstad and Lt. Governor Reynolds have worked to put policies in place to ensure that every student feels safe and respected at school. The announcement Monday will advance the governor’s, first lady’s and lt. governor’s priority of preventing bullying in Iowa’s schools.